The Black Ghost is a very shy fish. Keep plenty of plants, some floating and some ground cover, to help this fish feel more at ease. It is a good idea to keep a short section of empty pipe in the aquarium for the Black Ghost to hide in. This fish is sensitive to bright light and water conditions. The Black Ghost uses a weak electrical discharge to locate its prey. The Black Ghost is mostly carnivorous but may accept peas in their diet. They prefer to eat foods such as bloodworms, beef hearts, brine shrimp and krill. They are not to be trusted with fish that are small enough to fit in their mouths. 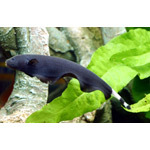 Little information is known about their breeding habits in the aquarium. Successful breeding is taking place in Asia and Australia but information cannot be found about what their methods are. Generally peaceful to the point of timidity, although larger specimens are likely to eat small fish. It will not do well with very active or aggressive tankmates and is best kept with other peaceful species that it cannot fit into its mouth. Considering its potential size, species attaining less than 6" should therefore be discounted. South American cichlids such as Geophagus or Satanoperca sp., angelfish and even discus are good choices. Other possibilities include larger characins and peaceful catfish.